A power outage traps Dr. Kavita Rao, Madison Jeffries and Doctor Nemesis in their lab with their captive vampire. Only, it’s not so captive now – thanks to the lack of electricity. They must survive being locked up, as the vampire stalks them in the dimly lit laboratory. Can they figure out a way to neutralize the threat before they’re all killed? 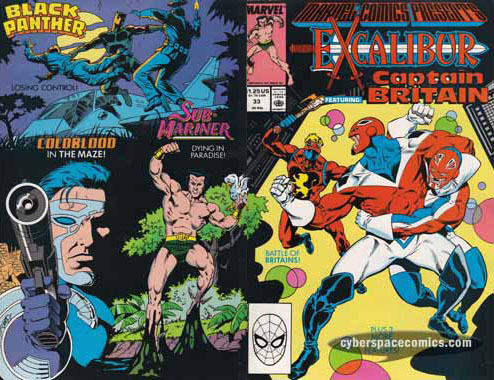 I haven’t read a current X-Book in years so the only character I was familiar with was Jeffries (I know him as Box from his tenure with Alpha Flight). That being said, this makes a much better survival-horror story than an X-story. Once I managed to shift gears from X-MEN X-MEN X-MEN to SCARY HORROR TERROR, I was able to enjoy the tale for what it was. But, it certainly took me quite a few pages to get to that point. Clayton Crain’s cover art is spectacular! But, it makes Walta’s interior artwork look even that much worse in comparison. Although, once I mentally switched gears from x-story to horror story, the artwork seemd a better fit. 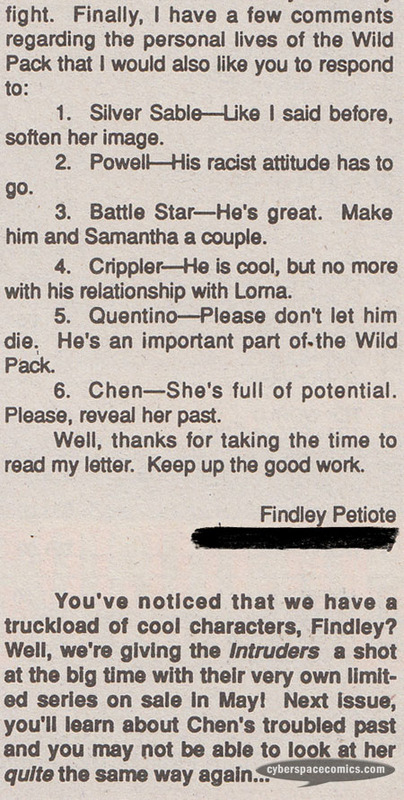 The last question remaining is: Is this important to the Curse of the Mutants storyline? Only in the sense that our heroes discover a way to neutralize the “telepathic virus” that the vampires have developed. This issue spotlights Captain Britain‘s imprisonment by the Loonies. They’ve trapped him on an island surrounded by an ocean of alcohol, where he’s besieged by doppelgangers of himself. Meanwhile, the freed Kitty Pryde ransacks the control center. Back on the island, the copies are done-in by two bullet wounds – Cap is rescued by the Beverly Hillbillies! And, after they part ways, he finds himself on Oz’s Yellow Brick Road that takes him to Cheers (the famous bar!). In the last panel, it’s revealed that all of this is being played out in his mind – as the Loonies look on. Doeke Riebeeck’s men come across the Black Panther’s glider and they begin to destroy it. And, as the Black Panther and Zanti Chikane travel through the forest (towards the glider), the Panther begins to analyze the events of the recent days. He explains to Zanti how he came to believe that Pretorius had his mother. The only thing he hasn’t put together yet is what motive Pretorius would have to capture her. As they near the glider, the Panther hears the men attacking it, and he leaves Zanti behind to rescue the machine that can carry him quickly to his mother’s prison. Unfortunately, when Zanti arrives on the scene, he is struck by a barrage of bullets! As Coldblood-7 continues to advance towards Mako’s headquarters, he comes to realize that his computer’s sensory input is malfunctioning and he cannot rely on it anymore. Eventually, he comes across Gina and it appears that she’s a robot, too! But, is it really Gina? Is she really a robot? Coldblood can’t trust anything now that his visual input is in doubt. On a leisurely outing, Namor the Sub-Mariner playfully frollicks amidst a tropical paradise. But, he comes across an oil spill that is ruining the land. As powerful as he is, he’s helpless against the incoming tide of blackness that is devastating the water and its inhabitants. This Excalibur story continues to expand upon TV/movie themes. The Erik Larsen art is great to look at but, I’m not really sure why there are so many pop culture nods or if we’re supposed to suspect there’s a known villain behind the Loonies. I’m excited that the Black Panther feature is nearing its end. As powerful and epic as it has been, I’m ready for it to be over – it’s extremely serious with no real signs of humor or joy. Kind of depressing to read – especially since there are so many chapters of it! The new twist in the Coldblood feature is very cool – can you imagine not being able to trust that what you’re seeing really exists?! And, I should mention that the Namor solo was wordless. That can be a tricky thing for the comics medium, but Jim Lee handles it well and tells McGregor’s story without needing words to convey the emotions that Namor is experiencing. Gerry Conway has written tons of comics. His writing credits include a who’s who list of the top characters from both big publishers including Avengers, Batman, Captain America, Daredevil, Fantastic Four, Justice League, Spider-Man and Superman. 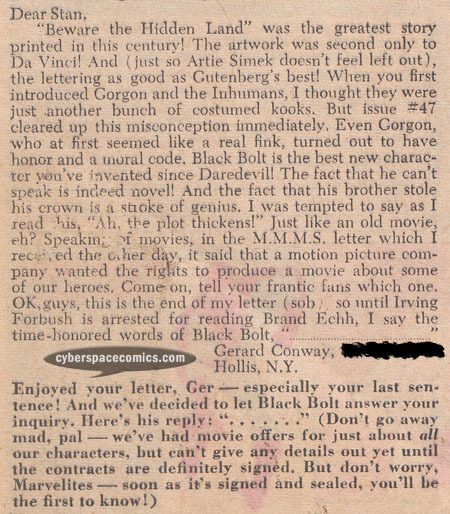 He got a letter printed in Fantastic Four #50 (cover date – May 1966), praising the creation of the Inhumans. Silver Sable operates a legitimate mercenary operation. Her most well-known team is the Wild Pack but, she also had a squad called the Intruders. It was made up of super-powered or costumed mercs including Sandman, Paladin, Fin and Man-Eater. 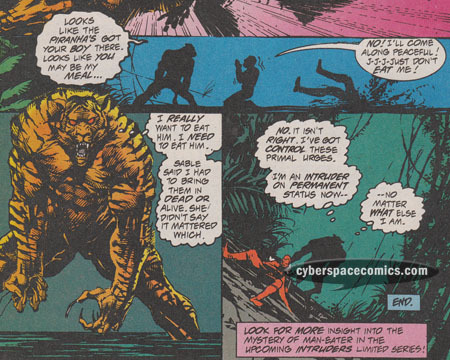 In Silver Sable & the Wild Pack #19, Man-Eater had a solo back-up feature that revealed he’s the result of a man and tiger merged together. The last panel also teased an upcoming Intruders mini-series! In the next issue, it’s announced that the Intruders mini-series will be available in May of 1994. That would probably have given it a cover date of August 1994. Once Silver Sable & the Wild Pack #27 came out (cover date of August 1994), it was announced that the Intruders mini-series had been delayed. This is probably because sales of the main title had begun to slip. 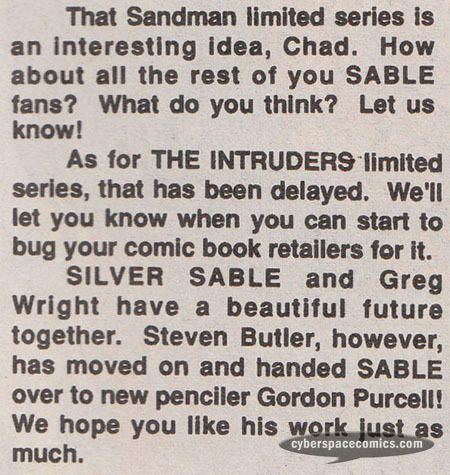 Interestingly enough, one issue before Silver Sable & the Wild Pack was canceled, they were still hopeful that the Intruders would be published. Needless to say, it never came out. No creative team was announced and we never saw any teaser art. It’s unfortunate, because there was certainly a lot of back-story to be filled for Fin and Man-Eater. 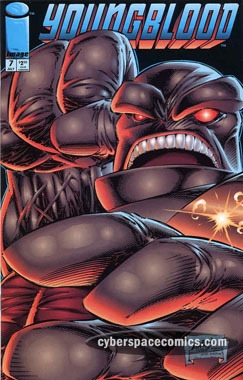 It’s hard to look at Youngblood’s Badrock and not see the similarity to the Fantastic Four’s Thing. 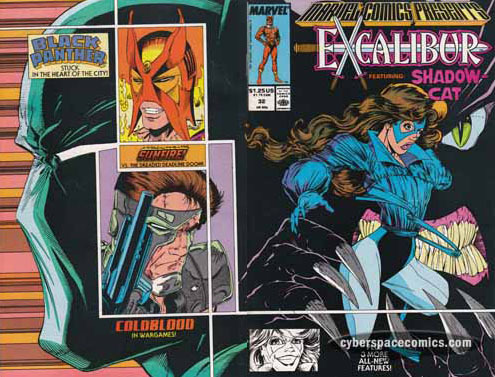 Although, this cover “swipe” by Liefeld (Badrock’s creator), leads me to believe that his character is more of an homage than a swipe. The Guardsmen at the Vault discover Eddie Brock separated from a lifeless symbiote in Venom’s cell. It appears that Venom may be dead and gone – leaving Eddie Brock in the unique position to file an appeal. His lawyer, Matt Murdock (otherwise known as Daredevil), is out to make the case that Eddie Brock is a completely separate entity from that of the super-villain, Venom, and should therefore be found innocent of Venom’s crimes. And, when the counsel calls upon its main eye witness, Spider-Man, will his testimony help procure Eddie’s innocence? You can be sure that Spidey doesn’t hope so! Leave it to Peter David to come up with such a neat idea! He intricately weaves this Spider-Man/Daredevil/Venom story so well that any of the three could have had their name on the title and it would have been appropriate. Each character gets plenty of time to shine and each one is written in tune with their established personalities and convictions. This issue has a cover price of $1.25 but it was actually only available if you donated $5 (or more) to UNICEF. On top of the donation, you also got a nifty embossed cover and an in-bound poster! So, let’s recap: great story, enhanced cover, poster and donation to UNICEF. How can you go wrong? Back at their base, the Loonies release each member of Excalibur into their own cells. Within her quarters, Kitty Pryde finds herself up against Rochester (a monstrous version of Looney Tunes’ Sylvester)! After defeating the big cat, she discovers he’s a robotic automaton and uses her phasing powers to break free of her prison. The Black Panther makes his way to the city of Johannesburg, where he’s stalking the mercenary, Strike (who delivered his mother’s note to Sarah Slade). The panther attacks the man and, after defeating him, he tricks Strike into confirming that his boss is Anton Pretorius. Believing that Pretorius has his mother, he sets off to his home in Capetown. Coldblood-7 sets out to Mako’s base with the intent of rescuing Gina and shut down his operation. Meanwhile, Mako is courting big money high-rollers who are interested in his cyborg program. Japan’s most respected businessman, Kishi Oramosha, intends to incite a world disaster in order to force the nations of the world to work together and build a better future. But, as great as the end results may be, it’s up to Sunfire to prevent him from unleashing his plan. The Sunfire plot seems like an extremely watered-down version of Ozymandias’ plan from Watchmen. I’d stick with Alan Moore’s version … :-p But, hey! 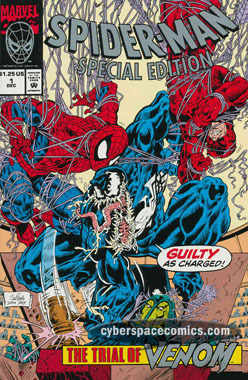 Look at that great, vintage McFarlane cover! Pete Von Sholly has written and illustrated a few comics through the years. 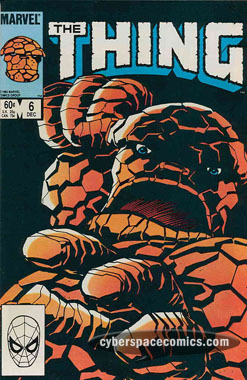 His credits range from Zero (an underground comix series from the 1970s) to some stories in Dark Horse Presents in 2000. The bulk of his professional work is storyboard/design for movies. His IMDB profile lists over 50 works including Nightmare on Elm Street 4, the Mask, Mars Attacks, and the Cat in the Hat. 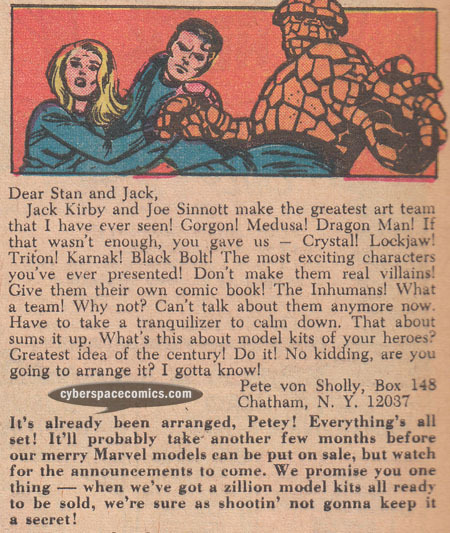 Prior to all that, he got a letter printed in Fantastic Four #49 (cover date – April 1966). 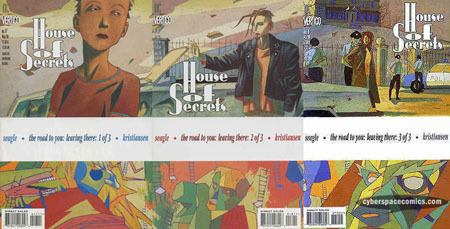 Vertigo’s House of Secrets was a pretty neat “horror” title written by Steve Seagle with art by Teddy Kristiansen. In the middle of the series, the main characters left the House of Secrets and went on a road trip. 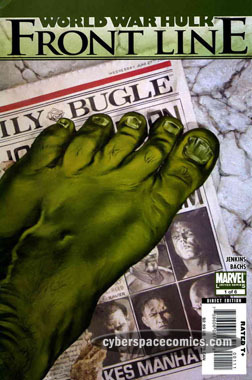 Front Line follows Ben Urich and fellow reporters during the events of World War Hulk. 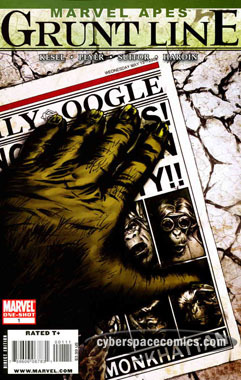 A little while after issue one was published, Marvel Apes got to poke fun at it with this cover and the title.